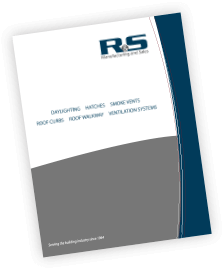 R&S supplies a complete set of roof products and accessories for the metal building industry. Our Metal Building Roof Products are compatible with any Standing Seam or R-panel roof system. No additional curb or flashing is required. Our CAD library includes the vast majority of metal panel profiles, so just supply the roof model and we’ll take care of the rest. Estimating and fulfillment follow the R&S Complete Solutions approach. As a result, you’ll receive the right product, curb dimensions, sub-framing and installation that meet project requirements. Engineers on staff will recommend the right product to keep your project on budget. For example, simply provide the equipment schedule and our team will respond with the correct curb dimensions and duct supports for the job. Complete Solutions include all sealants, fasteners and sub-frame for the install. Furthermore, shop drawings and installation guides come standard with all orders. With over 50 years’ industry experience, we are your trusted partner for metal building roof products and accessories.